This season, the Styles Weekly office are absolutely all about the bob. Long bobs, short bobs, asymmetrical bobs, graduated bobs – you name it, we LOVE them. We think a bob hairstyle is the perfect and sophisticated look for the season – and we particularly love them full of curls! 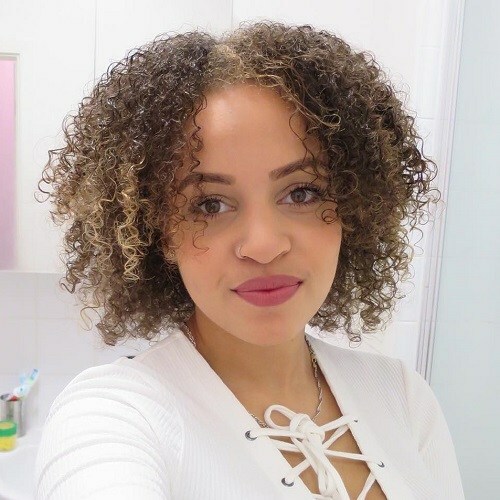 Whether you’ve got naturally curly hair or you can work magic with the straighteners, here’s some of our favourite ways to rock a curly bob this season. 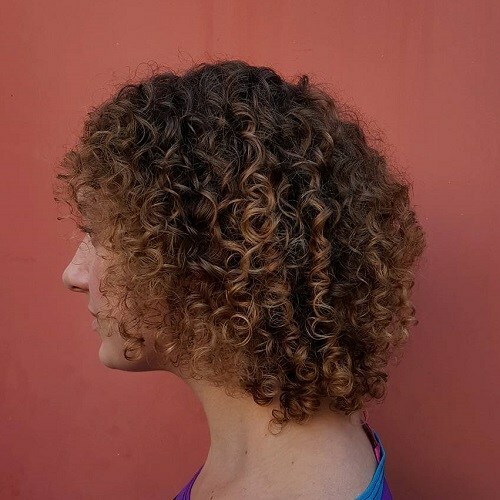 We’re starting our gallery of curly bobs strong with this gorgeous graduated bob which falls longer at the front around the jaw line and works its way to a shorter layer at the back of the head. The hair blends from a stunning light brown shade to a gorgeous caramel blonde through a balayage blend, and has been loosely tousled for effect. This is a gorgeous and oh so bouncy bob that is full of life and a range of gorgeous colours! Her incredible bob falls around the jaw level and is parted to the side, creating a gorgeous side fringe effect. She’s worked bright caramel blonde shades through her dark brown hair and curled it for a fantastic and bouncy effect that is so beautiful! 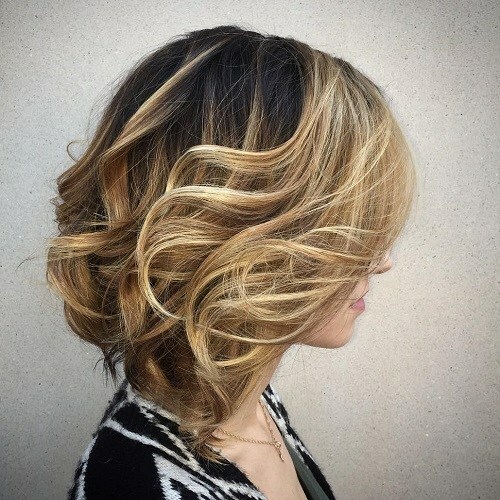 This utterly beautiful bob might just have stolen our hearts! Her incredible asymmetrical style has a lovely longer section at the front around the jaw level, and is cut a little shorter at the back of the head. Her hair is naturally a gorgeous glossy black yet she’s worked a stunning caramel blonde throughout the fringe section to finish it off. 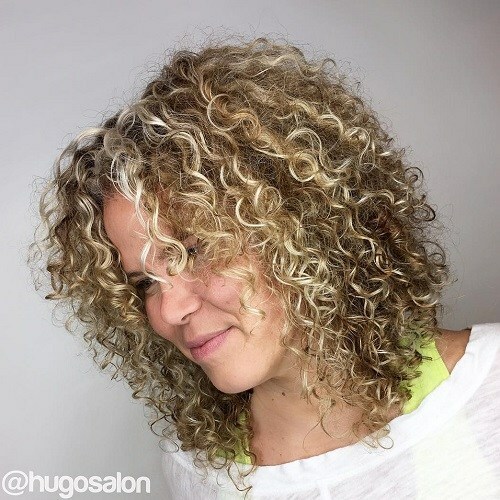 This lady is blessed with the most beautiful and natural corkscrew curls we ever did see – and what better way to show them off than work her hair into a gorgeous bob? Her incredible bob finishes around the jaw level, and has lots of little layers throughout for the fantastic finish. Her hair has been parted in the centre and is an amazing combination of brown and blonde shades. We absolutely adore this gorgeous black bob! With a stunning asymmetrical style, with one side longer than the other. She’s worked her incredible bob into a side parting and her fringe section falls perfectly on one side. Her hair is the most beautiful shiny colour which is oh so dark and dreamy! We love the graduated cut on the bottom too! 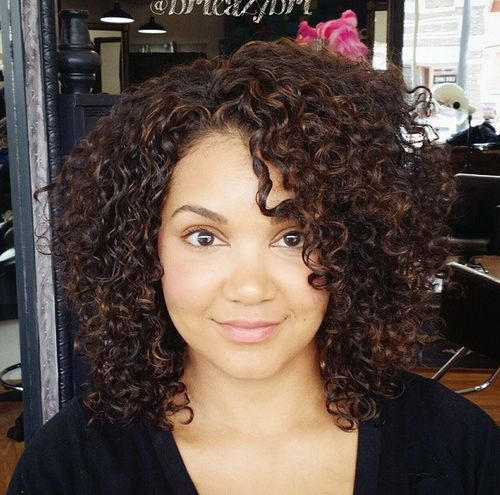 This absolutely stunning lady has worked one seriously fabulous curly bob look – don’t you think? With a lovely blonde balayage blend of ash blonde at the roots to a glossy golden blonde at the tips, this lady has parted her hair to the side in this stunning look. 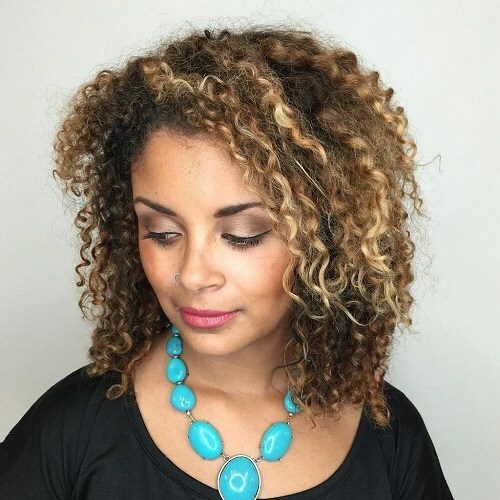 Her hair is naturally curly, but if you add mousse to natural curls it will create this stunning look! This absolutely glorious long bob is simply stunning – don’t you think? 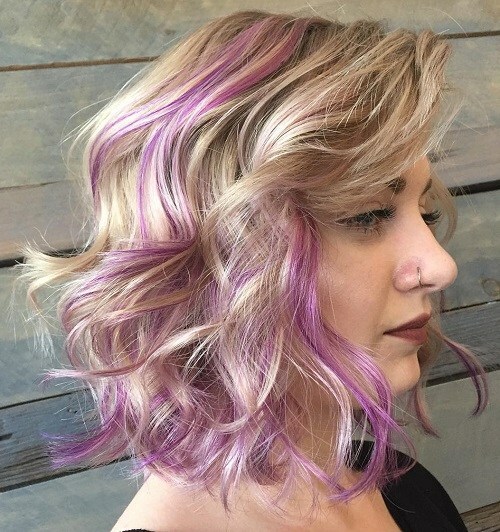 We cannot get enough of this striking finish with a white blonde colour blended with a beautiful pastel lilac. 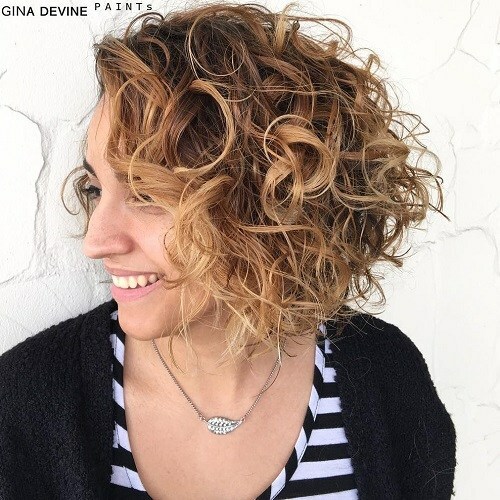 Her hair falls a few inches below the jaw and is parted to the side, finished with this bold and loose curl to create this remarkable voluminous end result that we adore. 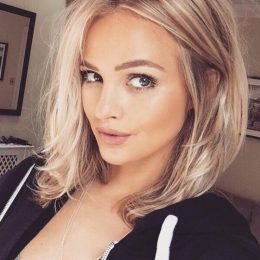 This absolutely breathtaking blonde bob has stolen our hearts! It falls an inch or so below the jaw, and is finished in a couple of different beautiful blonde shades! From a dark and glossy caramel shade to a gorgeous and vibrant bleached blonde, this look combines them all! She’s worked beautiful bouncy barrel curls throughout for a finish to die for. 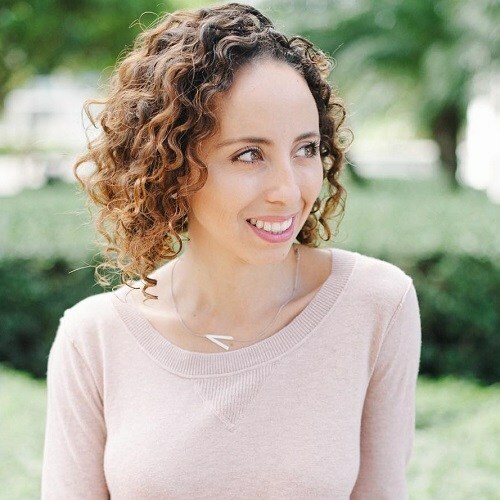 This is another lady who is fortunate enough to have the most incredible natural hair! These stunning corkscrew curls are all natural, but you can possibly recreate the style with a fantastic curling wand. Her hair works from a stunning dark brown to a gorgeous light copper shade at the tips through a stunning balayage blend. 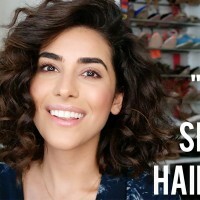 Of course, you can work gorgeous curls into your hair in a more subtle way – you don’t have to go all out curly with your bob, just like this gorgeous lady proves! 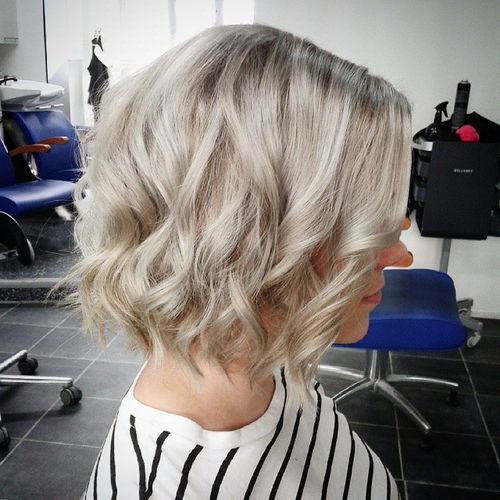 Her beautiful hair is a shade of silver blonde which is incredible striking, and to show off this wonderful bob shape, she’s gently curled the ends to create this silhouette that we love. 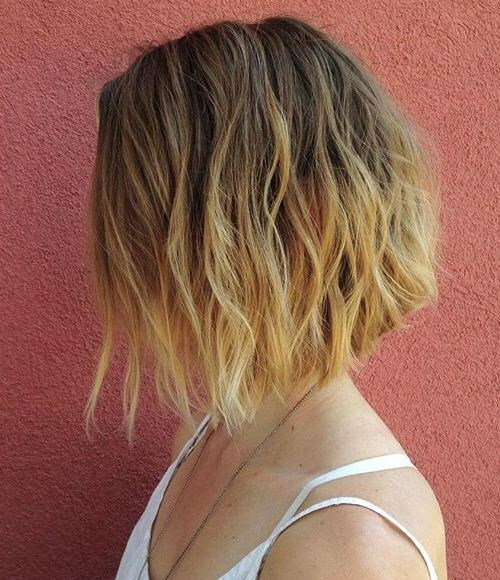 This is a lovely longer bob – and we adore the look! The ends of the hair are graduated, from a shorter section towards the back of the head and working towards a longer section at the front of the head, finished with a lovely fringe section. The hair is a dark brown which has been highlighted with white blonde streaks. The curls are tight and full of ringlets which we adore! This incredible brown bob has stolen our hearts – it works incredibly with this girl’s beautiful face too! Her hair falls just above the shoulders and is parted to the side, with a shorter fringe section on one side. 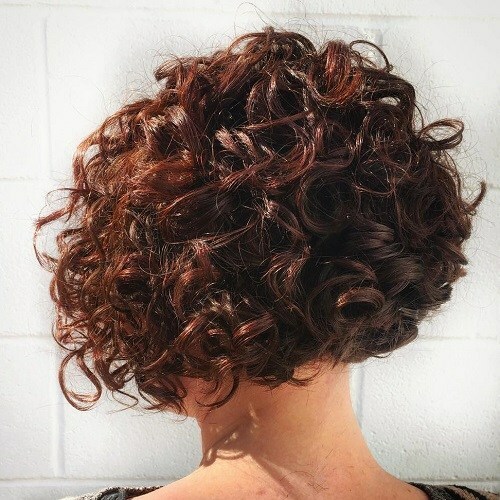 The colour is a combination of dark brown and a gorgeous red-toned brown, which work together perfectly, and we adore the bouncy and tight ringlets! This absolutely stunning hairstyle is edgy, contemporary and oh so cool all at the very same time. Her bob falls around the jaw level and is finished with lots of lovely shorter layers throughout for this bounce and volume. Her hair is parted to the side, and full of gorgeous caramel blonde shades and is finished with this fabulous tousled curl effect. 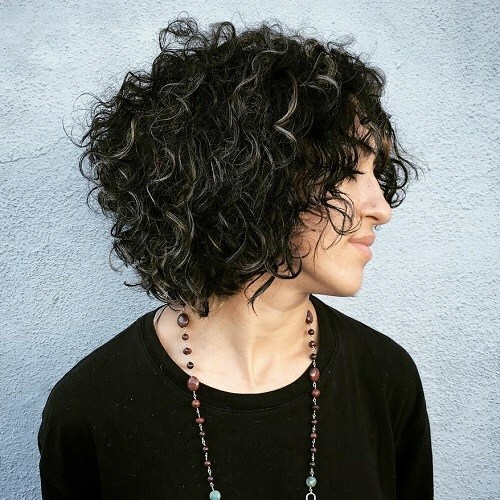 This absolutely breathtaking lady has one of our favourite curly bob looks that we ever did see! With a lovely side parting, this graduated bob falls with longer sections towards the front of the face and a shorter layer towards the back of the head. 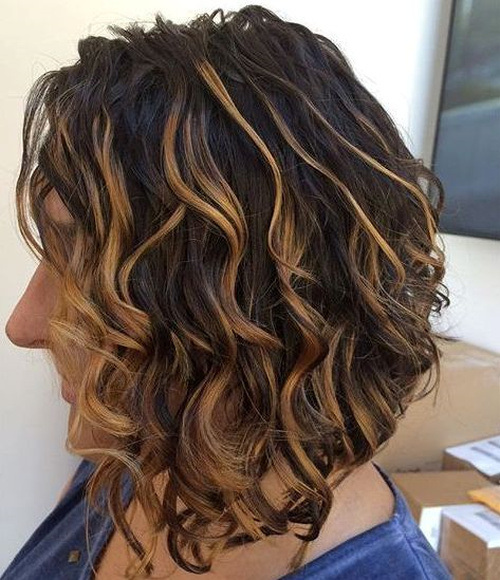 Her hair is an amazing balayage combination of dark and light brown, showed off by those gorgeous curls! Who ever said that black and blonde don’t work together? 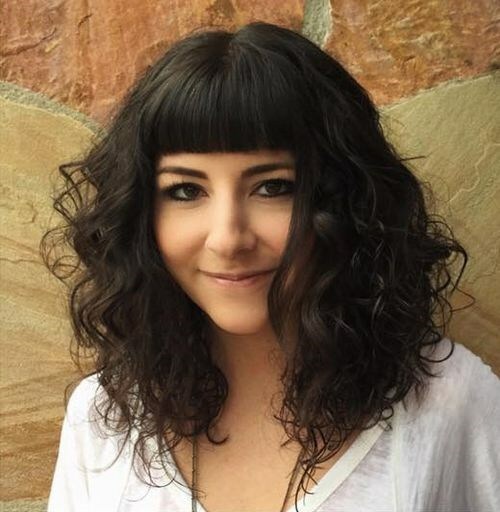 We think they look perfect – especially when worked into an incredible curly bob like this! This beautiful lady has glossy black hair which falls around the jaw level and is finished with subtle streaks of blonde throughout. Her curls are messy and tousled in a totally stylish way to seal the deal. 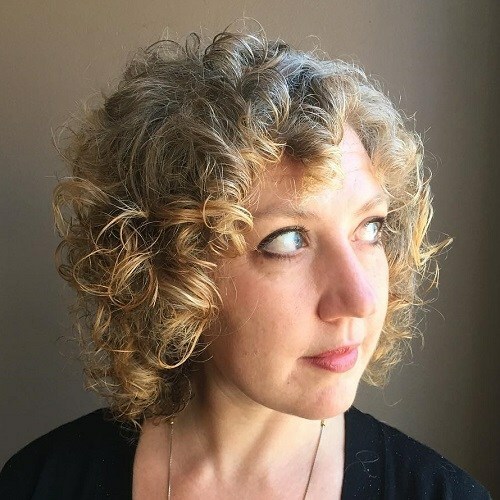 If you’re looking for a beautiful curly bob to stand out from the crowd, then why not opt for vibrant colours like this lovely lady has done? 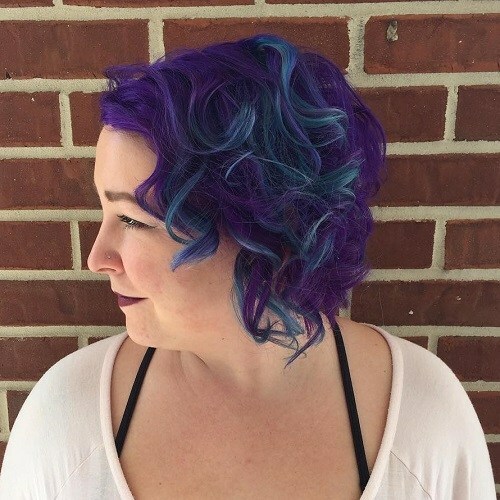 Her amazing hair is a combination of deep purple and a gorgeous royal blue, which work together perfectly to create this amazing look. She’s added tight curls throughout for this fantastic effect which we adore. This amazing bob is loosely curled to perfection – with a subtle wave which creates the most gorgeous effect. We think curls are the best way to show off a gorgeous colour transition, and this incredible style has a combination of rich browns and deep caramel shades, worked throughout this graduated bob with highlights. This absolutely beautiful lady is made even more stunning thanks to her incredible hair – don’t you agree? Her amazing long bob falls just above the shoulders and is worked with the most stunning natural afro curls we ever did see. Her hair is a rich dark brown which she’s added vibrant blonde highlights to the top and throughout the side parting for a stunning end result. 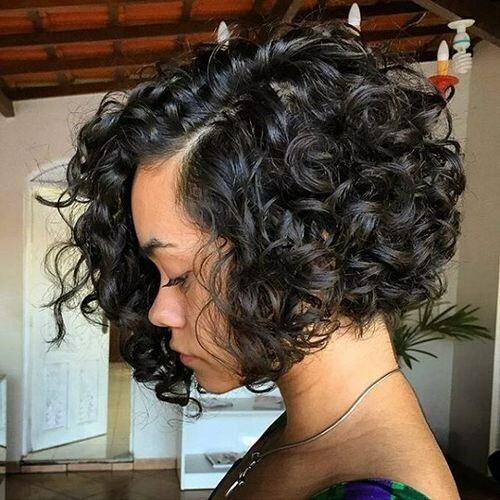 We think that this gorgeous curly bob might be our favourite from the whole collection – we can’t stop swooning! This beautiful and glamorous look is full of romantic sweeping curls which create the most flawless style just perfect for a wedding or a special occasion. Her roots are a dark brown but she’s worked a vibrant blonde throughout the fringe and the tips – we are in love. This incredible wedged bob is oh so fashionable. Starting a little longer at the front and finished in incredible stacked layers towards the back of the head, we simply love the wedged effect at work here! She’s worked lots of gorgeous and tight ringlets throughout to bring the layers of the cut to life, and has finished the bob with this amazing deep red colour. 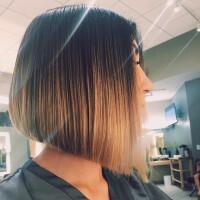 This longer bob is absolutely gorgeous – don’t you think? It falls a few inches below the shoulders and is parted in the centre, finished with a blunt and full fringe right across the forehead to frame the face. This lovely lady has kept the fringe straight and curled the ends of her luscious long hair, back combing for a voluminous effect which we adore. 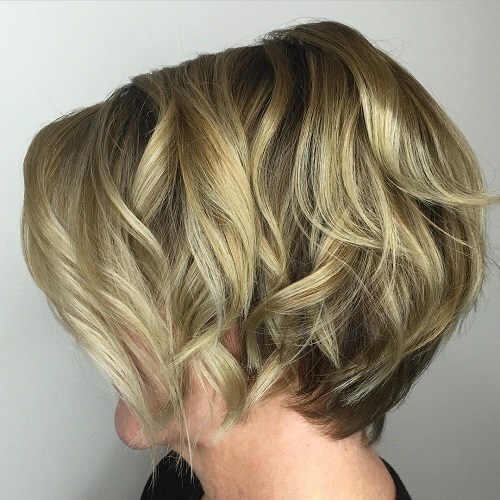 We’re finishing the gallery on a strong note with this beautiful short bob! 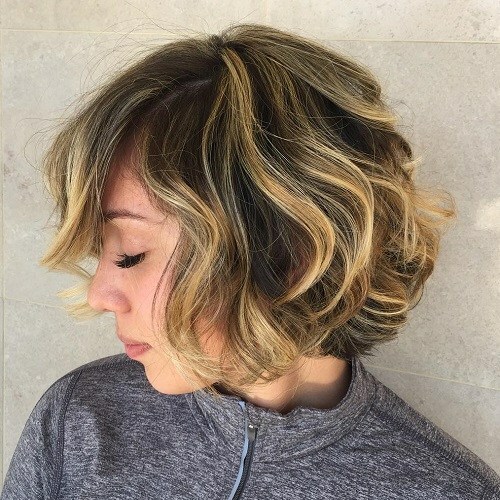 The bob falls ever so slightly below the ear length, and is a beautiful ash blonde shade on top with a darker brown colour showing through on the underneath. The longer top layer has been finished with loose waves which make the most beautiful bouncy style. 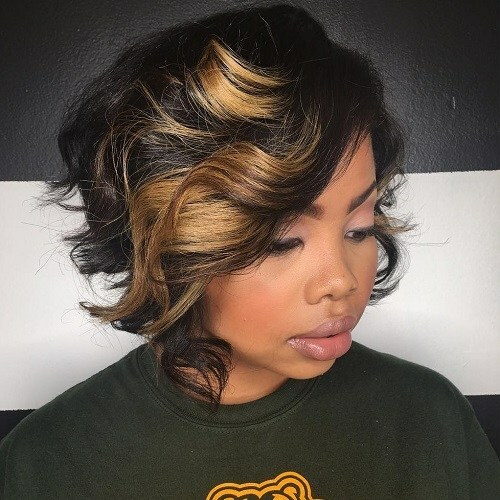 If you have a bob, then we hope this incredible gallery has showed you that a curly bob is most certainly the way to go. 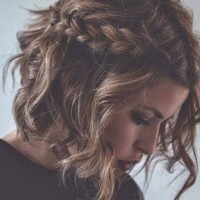 Whether you’re looking for a lovely day style or an exciting evening do – this gallery should be all you need for curly bob hair inspiration!